In the past power grids have been based on large power plants that supply electricity to end users via transmission and distribution networks built many years ago. This traditional model has done a good job of providing power reliably and securely. But growing demand for renewable energies is changing the nature of power grids. An increasing percentage of the energy that we use is provided by wind farms or solar farms, many of which are located a long distance from cities. As a result, local power and heat generation systems will emerge in local communities and become an increasingly common aspect of distribution networks. To ensure that such networks are able to receive high-quality energy from diverse sources while also supplying reliable power to users, the entire network will need smart management. This means that energy storage must be possible. Batteries mean energy can be available at any time, regardless of when it is generated. This is of real value for renewable energies, which are highly dependent on ambient factors such as sunlight and wind, while generation at any given time may exceed demand, thus leading to surplus energy. Figure 1. Situations causing power fluctuations, with required energy storage capacity to cover the same. Reliability and supply quality: these situations last just a few seconds and involve power levels of between 0.1 and 1 MW. 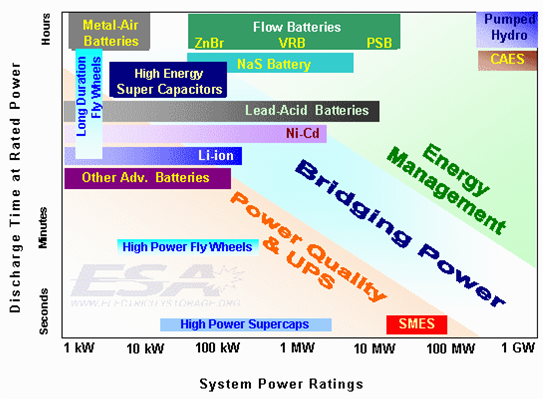 Batteries guarantee a sustained power supply with stable voltage and frequencies within acceptable service ranges. Stability of the transmission network: referring to situations lasting less than a second and involving power levels of between 10 and 100 MW. Batteries can absorb potential grid fluctuations, meaning the customer is not inconvenienced by the same. Local transport and distribution facilities: referring to situations lasting one to two hours, involving power levels of between 0.1 and 10 MW. Batteries act as control mechanisms both for generation and consumption, providing stable continuity to the network both in terms of demand and supply. Energy management by customers: referring to situations lasting around an hour, involving power levels of between 0.1 and 1 MW. Batteries act as a private control instrument to standardize and monetize local facilities, by harvesting energy when its cost is lowest, at the complete discretion of the end user. Voltage regulation: referring to situations lasting around an hour, involving power levels of between 1 and 10 MW. Batteries provide the network with a tool to standardize voltages, to ensure that all services receive a similar and constant voltage, with no power failures or efficiency losses. Readily available energy supply: referring to situations lasting around an hour, involving power levels of between 10 and 100 MW. Batteries can respond quickly to specific urgent power requirements, which are normally unplanned, thus preventing failure to supply power to a particular service. The energy stored in batteries is supplied using fully controllable power and voltage levels. When power is supplied directly from generating sources it is tremendously difficult, if not impossible, to guarantee stable voltage and frequency levels over sufficient time to allow medium to long-term contracts to be signed. Batteries can guarantee supplies that will satisfy customers’ demands. Figure 2. 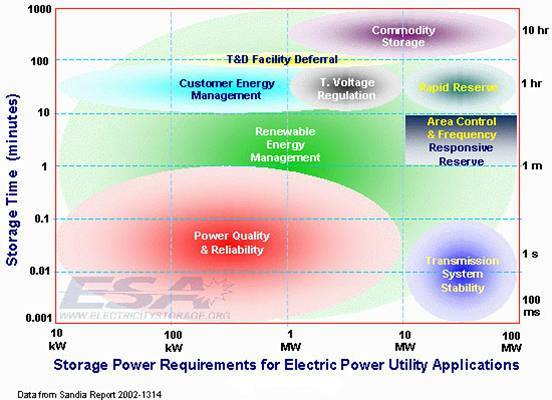 Current and foreseeable energy storage technologies for Smart Grid development.